Google has announced on Google+ they have added custom columns on the keyword and ad level. Google first added custom columns back in 2014 and then expanded it to support formula a year or so ago. Now, you can use custom columns on deeper level by placing them on the keyword and/or ad level. You can now get deeper insight into the business metrics that matter most to you at the keyword and ad level with custom columns. For example, see how engaging your ads are on mobile by creating a custom column for mobile clickthrough rate (CTR). 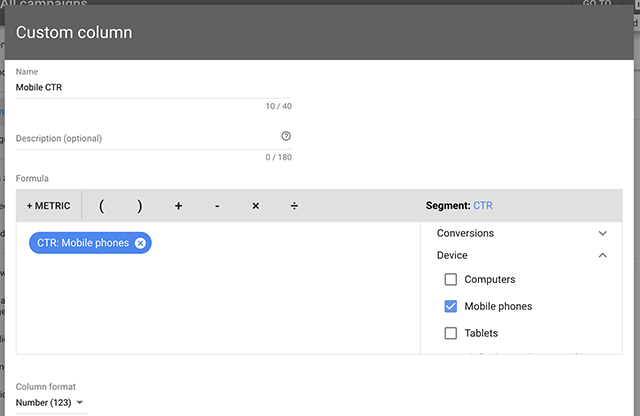 Or see which keywords are converting best on mobile by creating a custom column for mobile conversion rate. Google has more details on how this all works over here.